Jamie Baum is about contrasts. She's a flutist in a jazz world of primarily multi-reed "doublers," musicians who play primarily sax and play flute when needed. She's a writer of ensemble music, yet she's not played in jazz big bands, the traditionally fertile ground for ensemble composers in jazz. She thinks of herself as a player first and a composer second. She's a female player and bandleader in jazz community where males still predominate. Even more striking, she's a woman playing adventurous music. Jamie thrives on the self-challenges that come with contrast, so it's not unexpected that her distinctive music constantly demonstrates difference through layering and alternating different meters, musical motifs, instrumental timbres, and even styles of music. She likes to have lots of "different things" going on. In the light and dark, tension and release, high and low, sound and silence of her music, Jamie finds her artistry. "My attraction to contrasts," explains Jamie, "is because, with my music, I find that I'm always stuck in no-man's-land. It seems like for the club or the label or the whatever-it-is, my music's either 'too out' or it's 'too in.'" Even the title of this recording, Moving Forward, Standing Still (as well as the title of her previous CD on GM Recordings, Sight Unheard) is a contrast, almost like a Buddhist koan, the paradoxical riddles used by Buddhists for meditation (like the famous "What is the sound of a single hand clapping?"). A perfect example of how Jamie uses contrasts in the opening piece on the CD, "All Roads Lead to You." The "you," not coincidentally, is Igor Stravinsky, one of several contemporary classical composers who've influenced the music on Moving Forward. There are multiple overlapping and dovetailing lines, meters, timbres, tempos, and energies inspired by the piece she rediscovered while working on her graduate degree at the Manhattan School of Music. "If you listen to the Rite of Spring, you have these beautiful melodies which you can check out, but then you've got all this other stuff going on underneath, too: the strings doing one thing and the woodwinds doing another thing, then you have the basses and percussion doing something else." The piece contains also, by the way, one motif Jamie reworked from the Rite, and a phrase later in the piece apparently quoted from John Coltrane's "Naima" was purely coincidental, a factor of how great music creeps into the collective musical conscious (and unconscious). Quips Jamie, "I can't say that I've done anything original anyway. It's all from somewhere, you know." Phrases from one of Bela Bartók's string quartets are quoted in (yes, you guessed it) "Bar Talk," and Stavinsky's Rite remerges in "Spring," the first piece Jamie wrote for the Septet, a configuration she settled on artistically for its flexibility of size, the openness of its uncommon instrumentation, and the challenge of making a small group sound big. From a practical standpoint, she chose septet because it is large enough to give her a variety of voices to work with without being as big of a "money pit" as a larger ensemble. Adds Jamie, "I couldn't imagine what a big band would cost." Also, as a flutist, she's spent quite a bit of time over the years in smaller chamber-type ensembles playing classical music, new music, Brazilian music, and Latin music. Originally from Connecticut, now living in New York City, Jamie works performing, composing, recording, and holding clinics. She has toured extensively in the US, Europe, Japan, South America and South Asia, performing at festivals, clubs, and concert halls with her own ensembles and well as with luminaries ranging from Kenny Werner, Tom Harrell, Fred Hersch, and Randy Brecker to Dave Douglas, Paul Motian, and George Russell. A winner of several Down Beat Critics' and Readers' Polls and a recipient of several grants and awards, Jamie has participated in US State Department/Kennedy Center Jazz Ambassador Program, touring extensively in South America, India, and South Asia. She's active both as a private teacher at home and at the New School and as a clinician nationally and internationally. Jamie received a Bachelor of Music degree from The New England Conservatory and a Master's Degree from the Manhattan School of Music in jazz composition. She studied flute with Ransom Wilson, Robert Stallman, Hubert Laws and Keith Underwood; jazz improvisation with Richie Bierach, Dave Liebman, Jaki Byard, and Charlie Banacos and composition with Richard DeRosa, WT McKinnley, and Ludmilla Ulehla. With such a wide and thorough training as an instrumentalist, improviser, and composer, it's not surprising that influences of the various musics she's played and of various 20th century classical composers became a sort of theme for Moving Forward. Many pieces are conceptually as well as literally inspired. For example, an actual walk through the park inspired Jamie to base "Central Park" on the concept behind Charles Ives' orchestral piece "Central Park in the Dark," an atmospheric depiction of the varied and overlapping sounds one hears while taking a stroll through the New York landmark. "You go to one part of the park and you hear one thing, then as you're walking to another part, you're hearing something new, but you're still hearing some of the other," recounts Jamie. "It's a real Ivesian experience!" Moving ahead and standing still indeed! 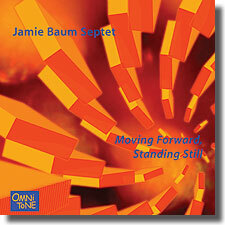 Buy Moving Forward, Standing Still now at the OmniTone store.